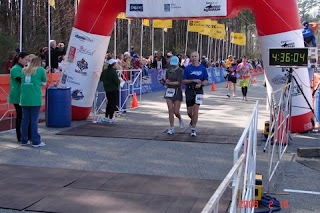 It's hard to believe that in 2005 I really had no desire to come run this race. I was just getting serious into the ultrarunning and loving the trails. I only came because my friend Jerry kept asking me too and I finally decided to run it mainly to pace Karla in her first marathon. 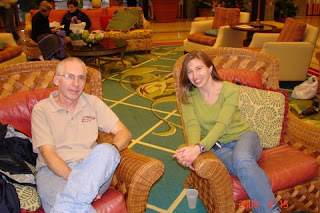 We were only casually acquainted at the time through the NCRC and had just run one time before with Jerry and Margo on New Year's Day of 2005 while she was preparing for it. 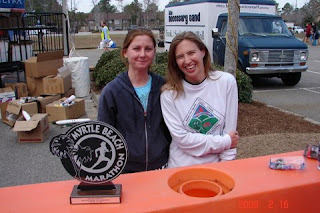 She would go on to qualify for Boston in that first marathon and our great friendship would grow from there as we became regular training partners. This year, the usual suspects Jerry, Karla, Frank and I would return for the 4th year in a row. The past few years the NCRC and other Triangle area runners have been coming down as a group making it a special weekend, not to be missed. Sadly this year it fell on the same day as the Holiday Lake 50K++, my first ultra in 2002, but I was committed to coming to run MB with Karla. Mark and Terri Dowd along with some others put on a great pre-race pasta dinner and post-race party at the Breakers Resort where we have a large block of rooms reserved. 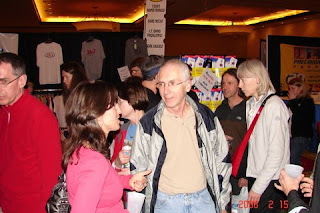 We arrived early Friday afternoon this year and went straight to the race expo for packet pick -up. I was most pleasantly surprised to see the Trail Angel was there. We were able to spend some time talking which we haven't had in a few months and I really needed her understanding ear that day. Funny how Angels tend to appear when you need them. Saw lots of other friends the re including my other lovely training partner Jenn. I was finally able to meet Eric Nesbit's family. I have been coaching Eric for the past three months to prepare him for a PR attempt in the half-marathon. We had a good time hanging around at the Marriott and the expo for a while and then it was off to the club pasta dinner at the Breakers Resort. More good times there socializing and then it was time to rest and get ready for bed. The only thing I don't like about the race is the 6:30 am start time. The good thing is it's only a mile to the start from the hotel so I don't have to get up toooo early at least. It was a lot warmer than ever before the start but we sat in the car until about 6 to stay warm before heading to the start. There we saw lots of NCR C people of course and other friends including the Dummars and Emily. We moved up through the runners ahead and found Jenn. She had not thought she was training adequately to run sub-4 like last year, but I had been telling her for months that I thought she was stronger than ever and should go for it. She decided just to go out easy the first few miles and see how she felt. I was once again just planning on running easy with the Marathon Princess and have some fun while training for the upcoming ultra's in the Spring. Karla has been coming back stronger in every race and although she knew she was not quite ready to try for sub-4 , we were hoping to run about 4:10. The gun went off and Jenn quickly disappeared ahead of us. So much for starting easy! Karla and I did start easy and went through the first mile in 10:06, just about exactly where I wanted it to be. After that we settled right into our planned pace and for the next several miles ran very consistently averaging about 9:25 pace. I guess with all the racing I've done and the aches and pains I've accumulated the past few months are the reason, but I never felt too good in this one. That pace should have felt like I was just out for an easy training run but I felt like I was working too hard. I could only hope it wouldn't get worse and maybe feel better as the day wore on. We were having fun anyway. What could be better than to be running a marathon with Karla? We passed Frank who was in the half after about 7 miles and saw many others from the club out on the course. We played leapfrog with Clarissa for a while as she was doing the run/walk thing in the half. After about 10 miles I could tell Karla was having a hard time holding the pace and then she told me she didn't think she had it today. We immediately decided to stop pushing the pace and just relax and try to get through the rest of the race as easily as possible. We slowed down a little and then steadily made our way around the course talking and enjoying the company as the miles passed by. She continued to slow gradually and by 20 miles was beginning to struggle. She said she was afraid there would be some walking today and by 21 miles she gave in and took a short walk break. I would spend the next few miles trying to keep her laughing and smiling as we tried to get to the finish as quickly and painlessly as possible. I looked back every once in awhile and with about three miles to go I saw the Dummar's coming. Susan was looking great and would go on to finish in a PR 4:20, about 30 minutes faster than last year. She should think about breaking her leg more often. She has been setting Pr's from 10K to 50K since last year. We finally found our way to the finish in 4:35:08 chip time. This was Karla's 10th marathon and I have had the pleasure of running 7 of those with her. Frank was waiting with the camera as usual after having exceeded his expectations in the half. He has been struggling with PF for months and had only run about 30 miles this year. We found Jenn and she was beaming after running a big PR 3:53. I told ya she could do it. Now she finally believes me when I tell her she can qualify for Boston and is ready to start doing some speedwork after the Umstead 100 coming up in April. Eric and family had already left. He didn't have a good race and missed his goal but I'm sure he will achieve that time in the near future. We then saw Laura and Katie. Laura had a sub-par day but just two weeks earlier had run a sub 8 time in the Uwharrie 4 0 mile. Katie missed her goal by one minute but still ran 3:16 and won the 25-29 age-group! We then waited around to watch Jerry finish. He would struggle today , a combination of lack of training , the Tybee marathon two weeks ago and getting sick. Somehow he survived and made it. Then it was off to the River City Cafe for a big, fat juicy BBQ Cheeseburger and Fries. Mmmmmm. Good seeing you down there and it was a pleasure to meet Karla. Please let her know that she has been a tremendous inspiration with her courageous battle against cancer and her impressive running accomplishments. See you at Umstead.